Veloxity phone charging kiosks ignited BizBash Live: The Expo New York this week. More than 2,000 event and meeting professionals filled the Jacob K. Javits Convention Center for BizBash Live in New York. And what a powerful show it was. BizBash knows how to put on an event that inspires, engages and fosters relationships among meeting pros. With David Adler at the helm, BizBash has been publishing digital content and producing trade shows and award shows for corporate event, meeting professionals and event marketers since 2000. At BizBash NY, there was the latest in marketing, design, rentals, catering, technology, and more. Veloxity proudly demoed cell phone charging kiosks with secure built-in lockers. The kiosks charge nearly every mobile device and tablets on the market today and offer complimentary charging via the safe and secure private lockers. The kiosks can be custom wrapped to meet any of your marketing needs. With the event’s all-access pass sold out, the tradeshow floor was bustling. 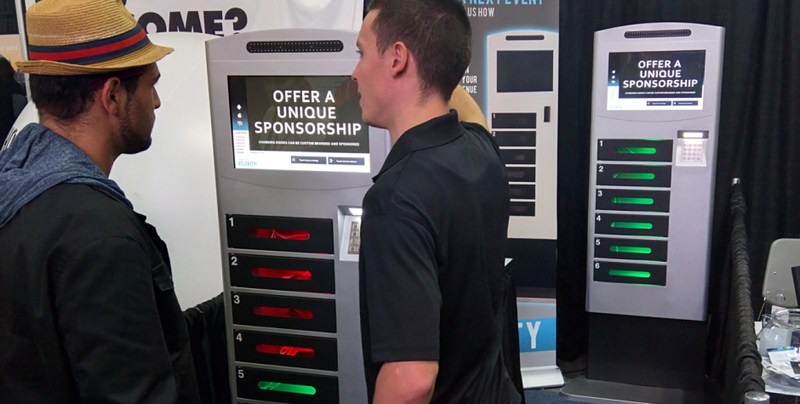 Attendees who visited the Veloxity booth had the opportunity to see how a Veloxity phone charging kiosk can help any trade show exhibitor or event planner reach, retain and delight the widest possible audience. Veloxity announced that the company was exhibiting at BizBash in a press release earlier this month. The team had an opportunity to attend some of the Event Innovation Forum and Workshop Series presentations, and mingle with like-minded folks from the event and meeting industry. Those who didn’t attend the show, can always contact Veloxity for a cell phone charging kiosk demo anytime.